Hoist/decompose integer division and remainder instructions to enable CFG improvements and better codegen. Definition at line 23 of file DivRemPairs.h. 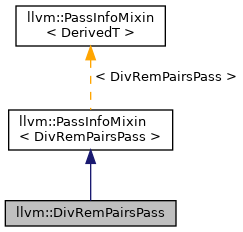 Definition at line 205 of file DivRemPairs.cpp. References llvm::PreservedAnalyses::all(), F(), llvm::AnalysisManager< IRUnitT, ExtraArgTs >::getResult(), optimizeDivRem(), llvm::PreservedAnalyses::preserve(), and llvm::PreservedAnalyses::preserveSet().